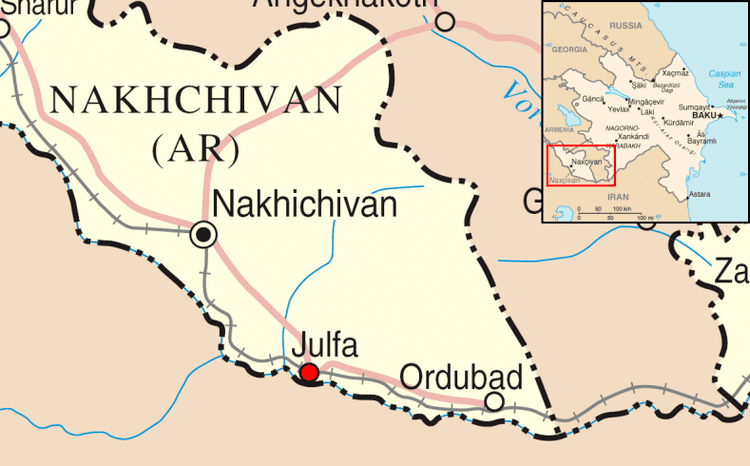 The Nakhchivan Autonomous Republic (Azerbaijani: ) is a landlocked exclave of the Republic of Azerbaijan. The region covers 5,500 km2 with a population of 410,000, bordering Armenia (length of frontier 221 km) to the east and north, Iran (179 km) to the south and west, and Turkey (only 15 km) to the northwest. The area that is now Nakhchivan became part of the Safavid dynasty of Persia in the 16th century. In 1828, after the last Russo-Persian War and the Treaty of Turkmenchay, the Nakhchivan Khanate passed into Imperial Russian possession. After the 1917 February Revolution, Nakhchivan and its surrounding region were under the authority of the Special Transcaucasian Committee of the Russian Provisional Government and subsequently of the short-lived Transcaucasian Democratic Federative Republic. 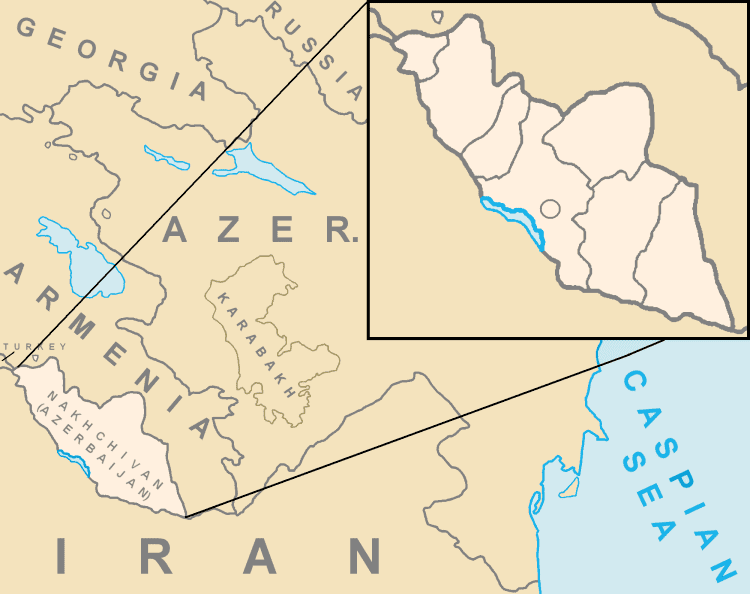 When the TDFR was dissolved in May 1918, Nakhchivan, Nagorno-Karabakh, Zangezur (today the Armenian province of Syunik), and Qazakh were heavily contested between the newly formed and short-lived states of the Democratic Republic of Armenia (DRA) and the Azerbaijan Democratic Republic (ADR). In June 1918, the region came under Ottoman occupation. Under the terms of the Armistice of Mudros, the Ottomans agreed to pull their troops out of the Transcaucasus to make way for British occupation at the close of the First World War. In July 1920, the Soviet Union occupied the region and on July 28, declared the Nakhchivan Autonomous Soviet Socialist Republic with "close ties" to the Azerbaijan SSR, beginning seventy years of Soviet rule. In January 1990 Nakhchivan declared independence from the USSR to protest the suppression of the national movement in Azerbaijan, and became the Nakhchivan Autonomous Republic within the newly independent Republic of Azerbaijan a year later. 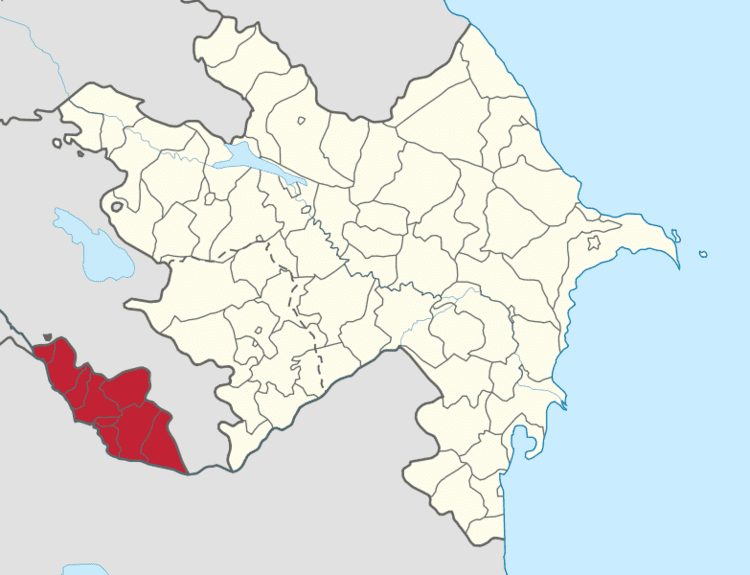 The Nakhchivan Autonomous Republic is an autonomous area of Azerbaijan, governed by its own elected legislature. The region continues to suffer from the effects of the conflict between Armenia and Azerbaijan, and its Karki exclave has been under Armenian occupation ever since. The administrative capital is the city of Nakhchivan. Vasif Talibov has been the leader of the Nakhchivan Autonomous Republic since 1995. Armenian tradition says that Nakhchivan was founded by Noah. The oldest material culture artifacts found in the region date back to the Neolithic Age. The region was part of the states of Mannae, Urartu and Media. It became part of the Satrapy of Armenia under Achaemenid Persia c. 521 BC. After Alexander the Greats death in 323 BC, various Macedonian generals such as Neoptolemus tried to take control of the region, but ultimately failed and a native Armenian dynasty of Orontids flourished until Armenia was conquered by Antiochus III the Great (ruled 222-187 BC). In 189 BC, Nakhchivan became part of the new Kingdom of Armenia established by Artaxias I. Within the kingdom, the region of present-day Nakhchivan was part of the Ayrarat, Vaspurakan and Syunik provinces. According to the early medieval Armenian historian Movses Khorenatsi, from the 3rd to 2nd centuries, the region belonged to the Muratsyan nakharar family but after disputes with central power, King Artavazd I massacred the family and seized the lands and formally attached it to the kingdom. The areas status as a major trade center allowed it to prosper; as a result, many foreign powers coveted it. According to the Armenian historian Faustus of Byzantium (5th century), when the Sassanid Persians invaded Armenia, Sassanid King Shapur II (310-380) removed 2,000 Armenian and 16,000 Jewish families in 360-370. In 428, the Armenian Arshakuni monarchy was abolished and Nakhchivan was annexed by Sassanid Persia. In 623, possession of the region passed to the Byzantine Empire. 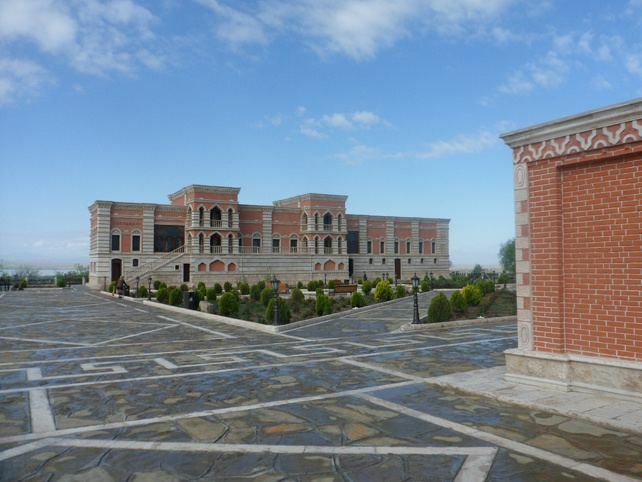 Nakhchivan is said by his pupil, Koriun Vardapet, to be the place where the Armenian scholar and theologian Mesrob Mashtots finished the creation of the Armenian Alphabet and opened the first Armenian schools. It happened in the province of Gokhtan, which corresponds to Nakhchivans modern Ordubad district. The violence caused many Armenian princes to flee to the neighboring Kingdom of Georgia or the Byzantine Empire. Meanwhile, Nakhchivan itself became part of the autonomous Principality of Armenia under Arab control. In the 8th century, Nakhchivan was one of the scenes of an uprising against the Arabs led by Persian revolutionary Babak Khorramdin of the Iranian Khorram-Dinan ("those of the joyous religion" in Persian). Nakhchivan was finally released from Arab rule in the 10th century by Bagratuni King Smbat I and handed over to the princes of Syunik. This region also was taken by Sajids in 895 and between 909 and 929, Sallarid between 942 and 971 and Shaddadid between 971 and 1045. About 1055, the Seljuk Turks took over the region. In the 12th century, the city of Nakhchivan became the capital of the state of Atabegs of Azerbaijan, also known as Ildegizid state, which included most of Iranian Azerbaijan and a significant part of the South Caucasus. The magnificent 12th-century mausoleum of Momine Khatun, the wife of Ildegizid ruler, Great Atabeg Jahan Pehlevan, is the main attraction of modern Nakhchivan. At its heyday, the Ildegizid authority in Nakhchivan and some other areas of South Caucasus was contested by Georgia. The Armeno-Georgian princely house of Zacharids frequently raided the region when the Atabeg state was in decline in the early years of the 13th century. It was then plundered by invading Mongols in 1220 and Khwarezmians in 1225 and became part of Mongol Empire in 1236 when the Caucasus was invaded by Chormaqan. In the 13th century during the reign of the Mongol horde ruler Guyuk Khan Christians were allowed to build churches in the strongly Muslim town of Nakhchivan, however the conversion to Islam of Gazan khan brought about a reversal of this favor. The 14th century saw the rise of Armenian Catholicism in Nakhchivan, though by the 15th century the territory became part of the states of Kara Koyunlu and Ak Koyunlu. Nakhchivan is an atmospheric, semi-desert region that is separated from the main portion of Azerbaijan by Armenia. The Zangezur Mountains make up its border with Armenia while the Aras River defines its border with Iran. The Araz reservoir located on that river supplies water for agricultural needs and the hydroelectric dam generates power for both Azerbaijan and Iran. Naxcivan is extremely arid and mountainous. Its highest peak is Mount Kapudzhukh (3904 m) and its most distinctive is Ilandag (Snake Mountain) (2415 m), which is visible from Nakhchivan City. According to legend, the cleft in its summit was formed by the keel of Noahs Ark as the floodwaters abated. Qazangodag (3829 m) is another major peak. Nakhchivans major industries include the mining of minerals such as salt, molybdenum, and lead. Dryland farming, developed during the Soviet years, has allowed the region to expand into the growing of wheat (mostly cultivated on the plains of the Aras River), barley, cotton, tobacco, orchard fruits, mulberries, and grapes for producing wine. Other industries include cotton ginning/cleaning, silk spinning, fruit canning, meat packing, and, in the dryer regions, sheep farming. Nakchivan’s signature cuisine includes shirin plov (sweet rice with gravy; made with mutton, hazelnuts, almonds and dried fruits), dastana, komba, tendir lavash and galin.